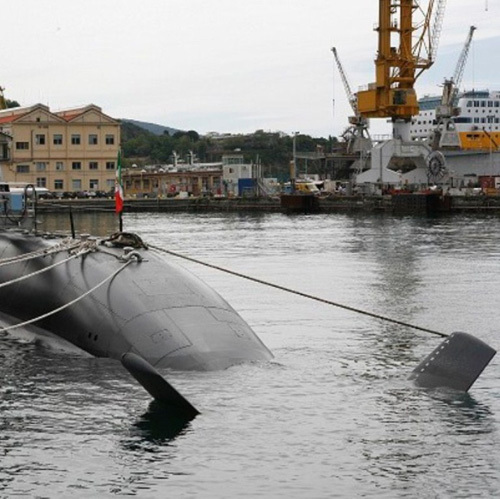 The submarine “Romeo Romei” was delivered Friday at Fincantieri’s shipyard of Muggiano (La Spezia). It is the last of the four U212A “Todaro” class twin units ordered to Fincantieri by the Naval Armament Unit – NAVARM for the Italian Navy. The submarine “Romeo Romei”, as its twin unit “Pietro Venuti” delivered last July at the Muggiano shipyard, features highly innovative technological solutions. It is entirely built with a magnetic material, using the most modern silencing techniques to reduce its acoustic signature. “Romei” has a surface displacement of 1,509 tonnes, an overall length of 55.9 meters, a maximum diameter of 7 meters, and can exceed 16 knots underwater. It has a 27-person crew. The “Romei” is the 102nd submarine built in the shipyard of Muggiano since 1907, when the Italian Royal Navy’s “Foca” submarine was launched. Since then, this shipyard has always stood out for building naval units, not only for the Italian Navy, but also for foreign navies (Brazil, Spain, Portugal, Sweden, Denmark). The building program of the submarines “Venuti” and “Romei” is the continuation of the project launched in 1994 in cooperation with the German Submarine Consortium, which has already led to the construction in the past years of six units for Germany and two for Italy – the “Todaro” and the “Scirè”. These latter units, delivered by Fincantieri in 2006 and 2007 respectively, are operating successfully as part of the Italian Navy’s fleet. Like the other vessels in the series, the “Romei” is equipped with a silent propulsion system based on fuel cell technology, producing energy through an oxygen-hydrogen reaction independently from external oxygen, ensuring a considerably higher autonomy in submersion than the conventional battery-based systems. It features an electro-acoustic system which is fully integrated into the command and control system, as well as a modern automation system of the control platform.